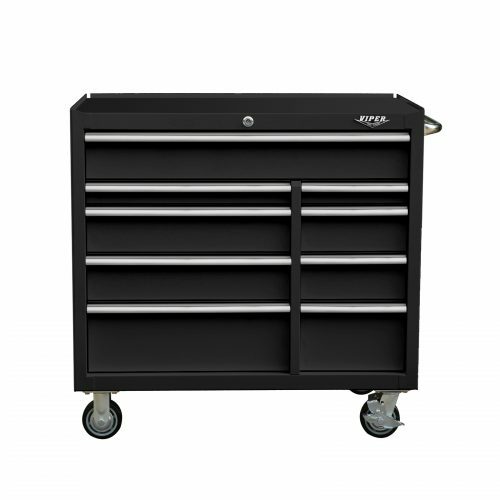 A must have for professionals, our 34-inch 3-Drawer Industrial Utility / Mechanics Cart will keep your tools organized and accessible. Built to last a lifetime, this heavy duty cart is built from 18 gauge steel with a corrosion resistant powder coated finish. The lid compartment offers ample room, with a smooth top that can be used as a work surface when closed. Gas struts in the lid allow controlled motion and keep the lid upright when open. 3 drawers with smooth moving ball bearing slides can hold up to 100 pounds each and include heavy duty pre-cut liner to cushion and protect your items. A bottom shelf area, and multiple pry bar holders provide even more storage space. Attractive full length extruded aluminum C-shaped drawer pulls have generous grip room. A side handle and 5 x 2 inch non-marring, chemical resistant casters (2 swivel and 2 rigid) let you keep your tools and supplies at hand while you move with ease around the shop or workspace. A 7-pin round keyed barrel lock secures the lid, and an internal locking mechanism gives you the option to lock the drawers or leave them accessible while the lid is locked.